The Miligold Macaw is a real beauty! ..and along with good looks, its parentage lends itself to giving this bird a gentle and affectionate personality! "Thumper" is a Miligold Macaw with the parents being a Military Macaw and a Blue and Gold Macaw. Hybrid macaws will inherit the personalities of both the parents. In the case of a Miligold Macaw this can make for a sweet, fairly even tempered bird that may even have some talking ability. The Miligold Macaw is a cross between a Blue and Gold Macaw and a Military Macaw. It is a first generation hybrid macaw, meaning its parents are two species of naturally occurring macaws.The Blue and Gold Macaw has been has been one of the most popular pet birds in the trade. The Military Macaw is a favorite pet macaw that also has a good temperament. It is very trainable and highly intelligent. The temperament and behavior of hybrids are areas of uncertainty and are unpredictable. But having parents are that are both quite docile and affectionate macaws, the Miligold Macaw will be a real beauty and should be a good natured pet bird. 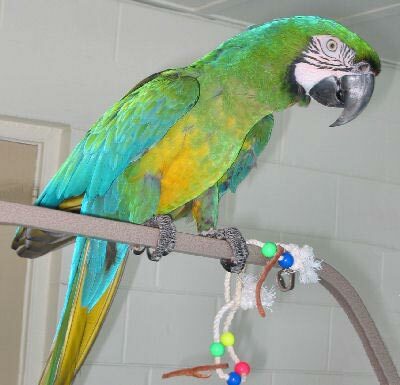 All macaws require good socialization and consistent training to make good pets. The Miligold's have the gentle nature and the speaking ability of their parentage and they can be a very affectionate, inquisitive, and fun pets. Scientific name: The Miligold Macaw is a first generation hybrid macaw. It is a cross between a Blue and Gold Macaw Anodorhynchus ararauna and a Military Macaw Ara militaris. Description: Miligold Macaws, being a cross between a Blue and Gold Macaw and a Military Macaw, can have a very pleasing coloration. Both parents of the Miligold Macaw contribute to the striking colors of their offspring, though the father's have the dominant gene and this will influence their final appearance. Some of the characteristics seen in this bird are the blues of the Blue and Gold being tempered on the Miligold to a more greener aquamarine, with the outer wings retaining blue flight feathers. The head can resemble the coloring of the blue and gold, though with more greens. It can also have the the red lore of the Military Macaw. The best way to be certain which bird is the father, however, is to ask at the time you obtain your bird. Size - Weight: The Miligold Macaw is a full sized macaw, however they will tend to be on the smaller side due to their Military Macaw parentage. Lengths can range from 27" up to 34" (70 - 86 cm). The Miligold Macaw is only occasionally available. Finding these beautiful macaws for sale is easier than some of the less commonly bred hybrids. Availability: This bird is only occasionally available. There are more and more macaw breeders however, so finding these macaws for sale becomes easier as they become more common. My Commando is an 8 year old miligold macaw. We adopted him from the Humane Society just over 1 year ago, being his second owner. He was not abused per say, but neglected somewhat due to a new baby in the home. We feel so blessed to have him! He is IN LOVE with my 12 year old daughter, allowing her to swing him in a blanket, making kissing noises and laughing the entire time! He says just about everything, too. If I come up to his cage at night, he always whispers, "I love you", everytime! He comes with me to the local elementary school, with some of my other animals, and shows off while I talk about his background. He is the perfect animal ambassador, and always says "goodbye!" to the kids when we leave. He is a big part of our family. (Hopefully they'll let me add a picture later..)While not for everyone, this macaw was a perfect fit for us! Miligold and Blue and Gold - there should be very little difference between them as far as growth and development. Your Milligold is a high bred between the Blue Gold and a Military and even those two are really about the same size - unless it was a Bolivian Blue Gold and that isn't likely. You can see some photos of the development of the Blue and Gold here, at Aves International. It shows you blue gold at 3 weeks, then at 5 and then 7 and I think 11. They are such fun and so full of curiosity. Yeah I have seen growth charts on blue and gold and a greenwing I am beginning to think the breeder is wrong on hatch date according to breeder it was 5 weeks old when I got it on Sunday this last week. I can already tell a difference in the body features so far but if he is almost 6 weeks old now I figured there would be more of a difference in him by now unless he is just a slow grower. I personally beleive that he might be a week or 2 younger then they thought it was it only bothers me to make sure that he is getting the proper amount of feedings he is getting I am feeding 3 times a day 35 to 40 ccs each time he eats good and poops good and sleeps good he is also really noticing me and follows me in his box when I am walking around him so he is very observant. I think I am just being a worry mom comes with the territory but I love him so much and just want him to be healthy. You can't do anything about whether the breeder got the hatch date screwed up or whether she just didn't want to hand feed. You can do what you need to do to insure health and growth of your baby now. I can't know how old your little one is but I think at that age, it should be on 4 feedings a day. That would be morning, afternooon, dinner and before bed - say 10 pm. That gives him all night to empty out. So you basically feed the baby when the crop is empty plus or minus a half hour or hour. You should be able to 'sorta see' through the crop and see whether he is empty. You can definitely 'feel' when the crop is empty. The formula should be the consistency of ketchup at this stage. Most formulas do not have the higher fat content that is required for macaws. You can add about 1/2 teaspoon of almond butter to the formula for each feeding to raise the fat content. For about a week, I would use pedialyte instead of tap water. The reason I am saying that is your comment about the lack of growth in the week and not knowing his age. Does he look like the pictures you are seeing and the age is just off? There should be some weight to him but we don't know the age so we can't tell the weight but at 6 weeks, he shouldn't look bony in the hips and he should be starting to fill out and feathers prickling through. If he is empty more than 3 times a day - then feed him more than the 3 times a day. We just don't know the age. This will probably only be for a week. The pedialyte will better hydrate him and the almost butter will add a little fat. When the crop is full, it sorta looks full and feels like a wet cotton ball. I found this handfeeding instructions which might help. I can't know as I don't know the age but 35 cc seems a bit low to me but I don't know the weight or age. I think the article from will help you.